Displays the basic dice roll probabilities for the Battles of Westeros board game. Suppose you are attacking a green unit with a red unit, and valor counts as a success, too. You would select 4 dice, and Valor. The unit you are attacking still has 3 figures. The chance to eliminate it completely would be 31.2%, or 60% for a flanking attack. 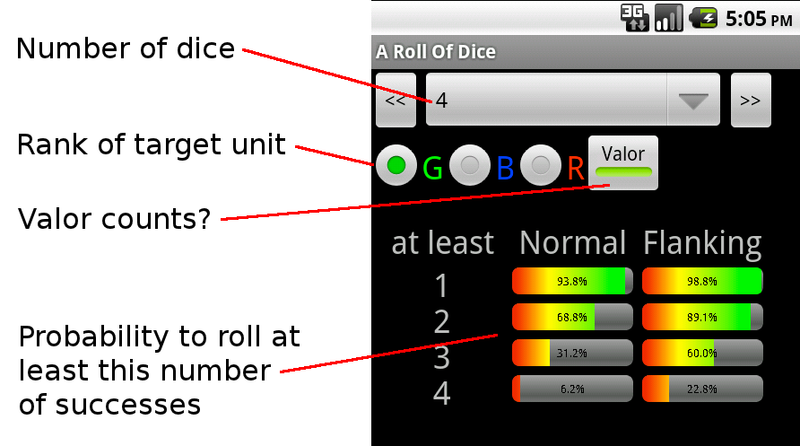 0.1.3 2012-07-04 Increased maximum number of dice to 12. Enlarged percent display for better readability. Rewrote probability computation, enabling upcoming new features. 0.1.2 2011-12-15 Increased maximum number of dice to 10. 0.1.1 2011-10-26 Fixed the bug that probabilities were not refreshed after changing the preferences.